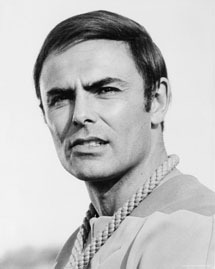 John Saxon may have appeared in countless horror films but he was often cast as the good guy. The dependable, no-nonsense cop/detective/sergeant/FBI agent...fill in the blank...are roles he knows well. Saxon was born Carmine Orrico in Brooklyn, New York in 1936. Although he attended acting schools in Manhattan, it was a photo that got the attention of an agent - and a contract with Universal Studios at the young age of seventeen. There were uncredited walk-ons in two 1954 films, It Should Happen To You and A Star Is Born...but Saxon's first real screen role was in The Unguarded Moment (1956). Saxon was considered a "heartthrob" and worked constantly, appearing in John Huston's western The Unforgiven and the melodramatic soap Portrait In Black, both in 1960. Did he realize when he made The Girl Who Knew Too Much in 1963 for Mario Bava that the horror genre would take up a hefty portion of his resume? Probably not. The Night Caller was released two years later. By the seventies, Saxon was one of the hardest working people in the business. The role of Lt. Fuller in Black Christmas fit him like a glove, and he would again play police officers in Blood Beach (1981), A Nightmare On Elm Street (1984), and two of its sequels: Nightmare On Elm Street 3: Dream Warriors (1987) and New Nightmare (1994). He was put to good use as a novelist's agent in Dario Argento's Tenebre AKA Unsane in 1982 - but perhaps one of his best roles was in Cannibal Apocalypse (1980) in which he played a doomed war vet who develops a taste for human flesh after his stint in Vietnam. Saxon was entirely believable...even as the story gets gorier and heads towards its downbeat conclusion. All in all, Saxon has appeared in nearly 200 feature films and television projects. It's hard to believe this still vibrant, busy actor has been in the business for nearly seven decades.